Increasingly, the airwaves around us are a jungle of competing wireless signals. Koingo Software’s AirRadar not only helps cut through the clutter, but also provides useful information about your wireless signal of choice. AirRadar quickly scans for surrounding wireless networks, pulling in a wealth of customizable information about them. AirRadar seems designed for users serious about their wireless safaris. It scans for available networks, displaying highly detailed information about their MAC addresses, broadcast channels, signal strengths, and numerous other categories only a network administrator could love. Users can easily add networks to a list of favorites, or filter them out of the main scan list. 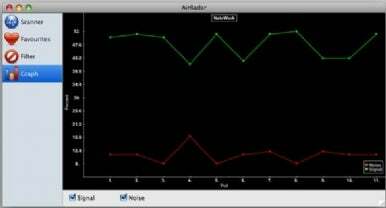 You can also pull up a graph of a given network’s signal-to-noise ratio, which the program tracks and compiles over time. You can even tell AirRadar to automatically find and join the nearest open network above a specified signal strength. If you’re an ordinary Joe Wi-Fi type like me, you can see how your network signal is holding up, and whether it’s on the same channel as competing networks that might be interfering with its reliability. Wardrivers roving the streets in search of open networks will find AirRadar a handy ally. And on a less shady note, wireless network administrators can use the program to probe for weak or slow routers in their buildings or campuses. A signal-to-noise graph lets you track a given network’s performance over time. For a $10 app, AirRadar is admirably polished and professional. A thorough Preferences window lets you customize pretty much everything, from the goofy sounds the program plays whenever its scan registers a new network to the colors of the graphs. The program’s Help menu is simple but effective, with plenty of useful information. Admittedly, using a program that digs up so much information about the networks around you feels a little creepy and intrusive. I’d advise using it respectfully and responsibly. But aside from the spy factor, AirRadar is a terrific little program, well made and well worth the $10 from wireless buffs.